Meet the incomparable benchmark for all things opulent. Silence. The chauffeur closes the huge coach door and my head sinks into a pillow as I exhale and close my eyes. It’s been a long, daunting week of airports and airplanes and screaming children and deadlines and meetings and traffic and crowds and phone calls and bad news and mayhem and unrest. But now it’s gone. Peace and quiet, comfort and silence. 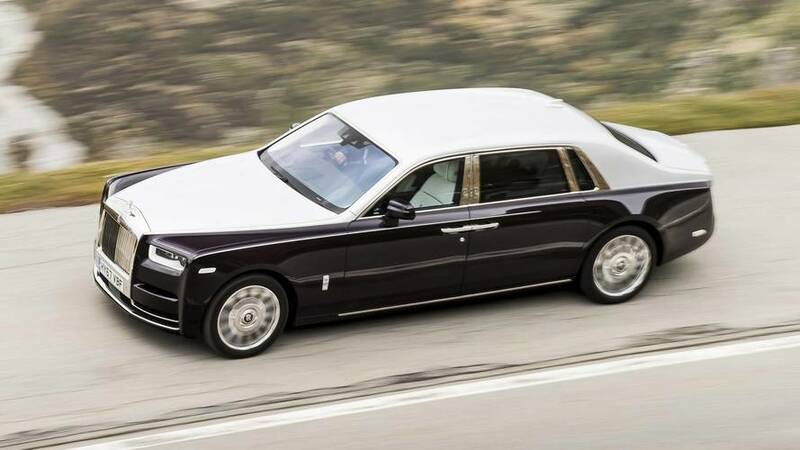 This Rolls-Royce Phantom is more than a car, it’s an escape. But as much as the Phantom is pure rolling serenity and isolation, it’s not a bore (or a chore) for whoever’s behind the wheel. 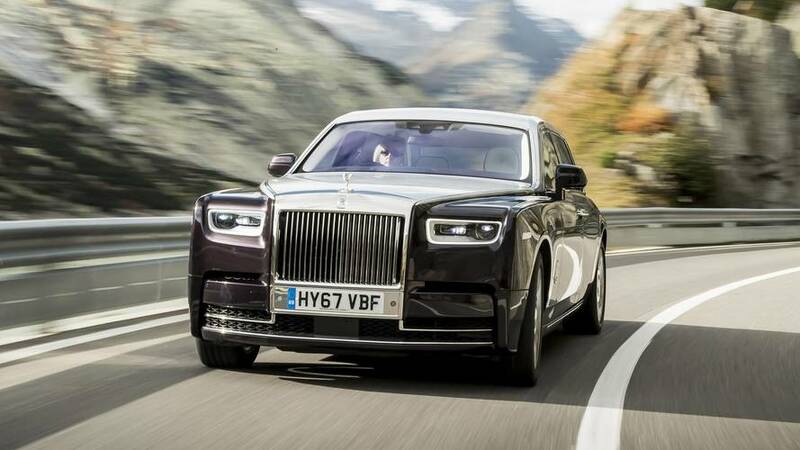 The Phantom rides on a new, scalable platform – the Architecture Of Luxury, as it’s so aptly named – that’s made entirely of aluminum and will soon underpin all future Rolls-Royce models. That means this car is both lighter and stronger than its predecessor, though it’s not like weight savings matters too much in a car that tips the scales at 5,700 pounds. For every bit of body mass taken away, it’s replaced by more noise insulating material. In fact, sound reduction is of such high concern, Rolls-Royce worked with the folks at Continental to develop a special version of the ContiSportContact tire that can be filled with insulating foam. Road noise is so uncivilized. On the winding Alpine roads of western Switzerland, I’m not breaking a sweat as I quickly point the prow down a long stretch of back-and-forth esses. This car is so quiet, I can barely hear the (say it in your best British accent) six-and-three-quarters-liter V12 fire up. And while it may carry the same iconic displacement as its forebear, this engine is entirely new, with a pair of turbochargers bolted on for maximum punch. Indeed, it packs a wallop, with 563 horsepower and, more impressively, 664 pound-feet of torque that’s delivered at 1,700 rpm. Rolls-Royce’s eight-speed automatic transmission uses GPS technology to note exactly where you are in the world, what the road ahead will hold, and adjusts the shift timing to keep the driving experience as smooth as possible. From every seat in the house – including behind that huge steering wheel – the transmission’s operation is imperceptible. Don’t even think about shift paddles. A car this smooth shan't be needing something so daft. 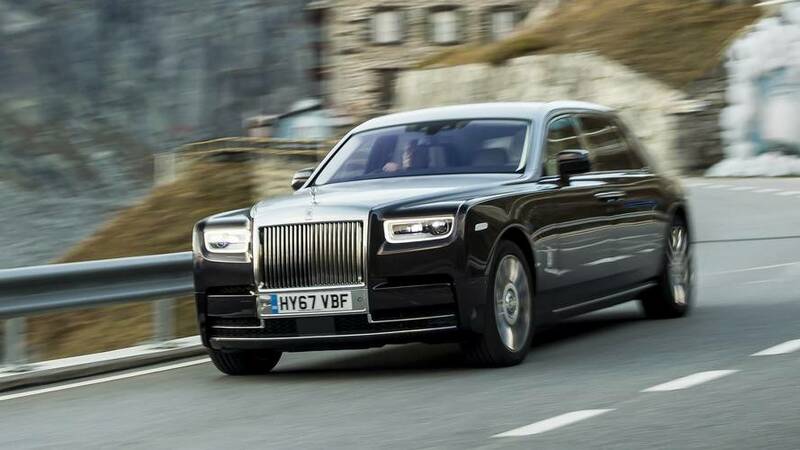 While a majority of Phantom owners still prefer to let hired help do the driving, there’s still a large percentage of customers – especially here in the States – who prefer to drive themselves. 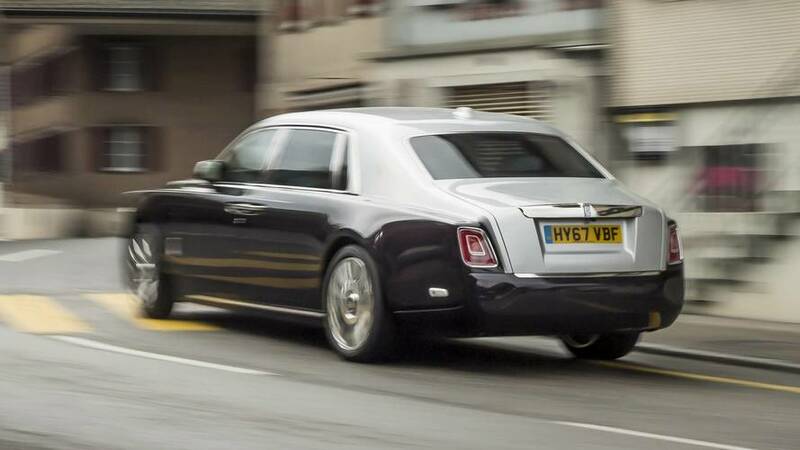 The old Phantom, while regal and impressive in its ability to waft with grace, can also be described as daunting and intimidating to drive. But that’s not the case anymore. 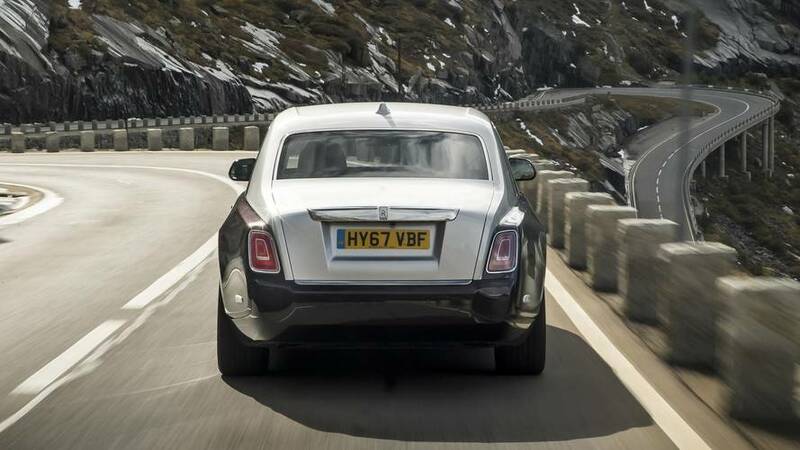 Don’t get me wrong, the 2018 Phantom is still a huge car – it’s nearly 20 feet long and 6.5 feet wide – but on the winding Alpine roads of western Switzerland, I’m not breaking a sweat as I quickly point the prow down a long stretch of back-and-forth esses. 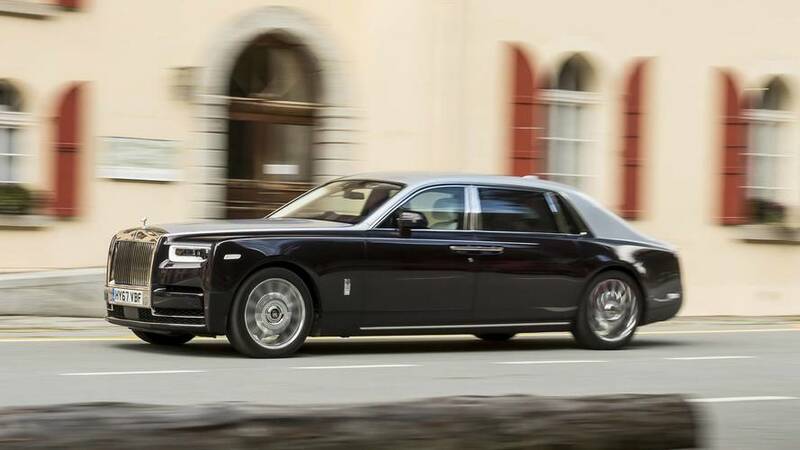 The Phantom’s got a number of dynamic tricks up its finely tailored sleeves, and the one that helps maneuverability most is four-wheel steering. 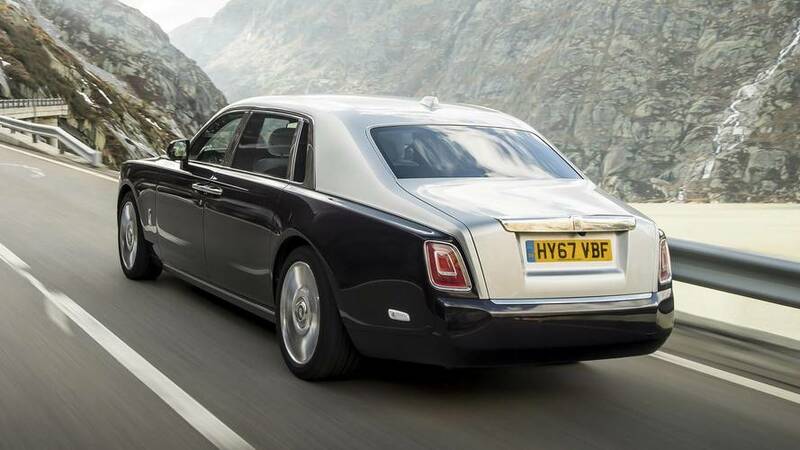 It doesn’t turn the big Rolls into a sports car – not even close – but it provides a level of mid-corner confidence that I don’t remember having in the old car. Not quite a nudge of assist, but more a comforting hand on the small of your back as you learn to use less and less steering effort as you round a tight bend. No part of the Phantom driving experience has a sense of urgency, even though it’s still capable of doing 0-60 in just over five seconds. You roll into the throttle progressively, the huge brakes bring it all to a halt with grace and poise. 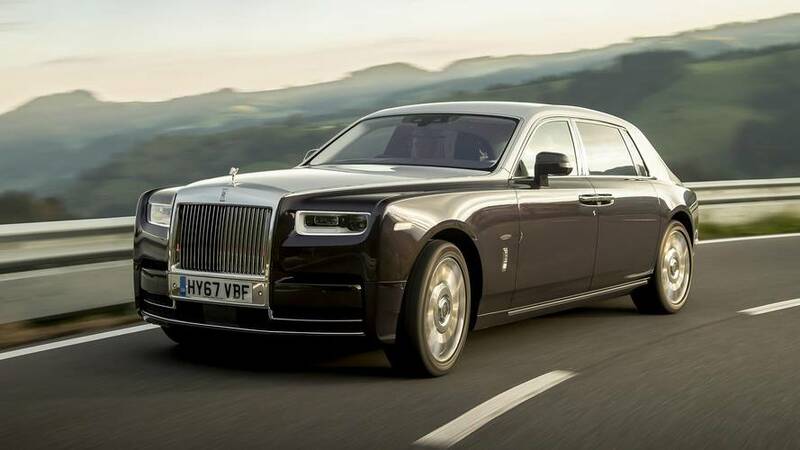 The new Phantom handles with the same sort of agility and leisure as Rolls-Royce’s smaller Ghost and Wraith models, which is to say, still very disconnected, but wholly in service of delivering that signature Magic Carpet Ride. 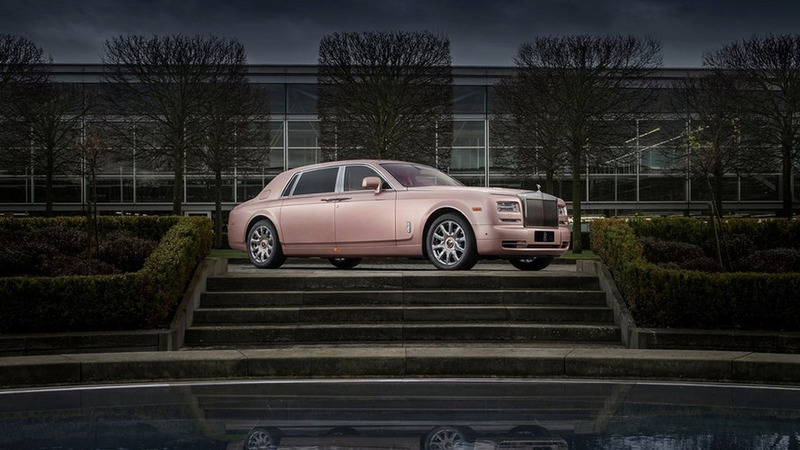 The idea with any Rolls-Royce is that you’re more relaxed when you get out than when you got in. And in the back of the new Phantom, I can feel my heart rate lowering by the second. 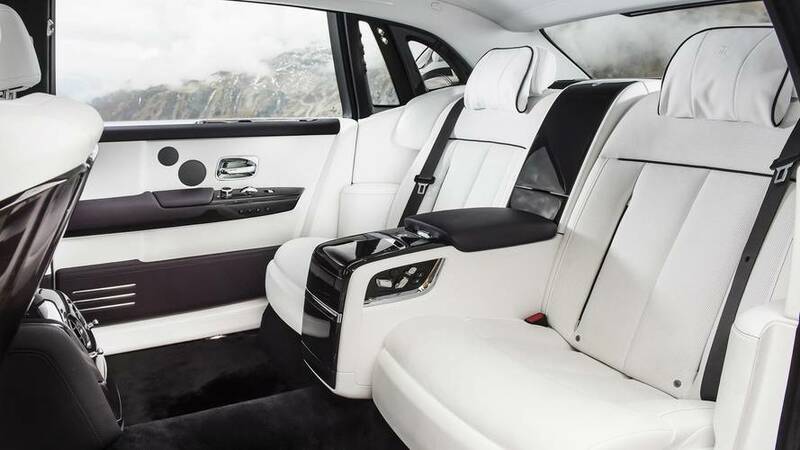 To my mind, as lovely as the Phantom is to drive, it’s far, far better to experience from one of the plush rear chairs. 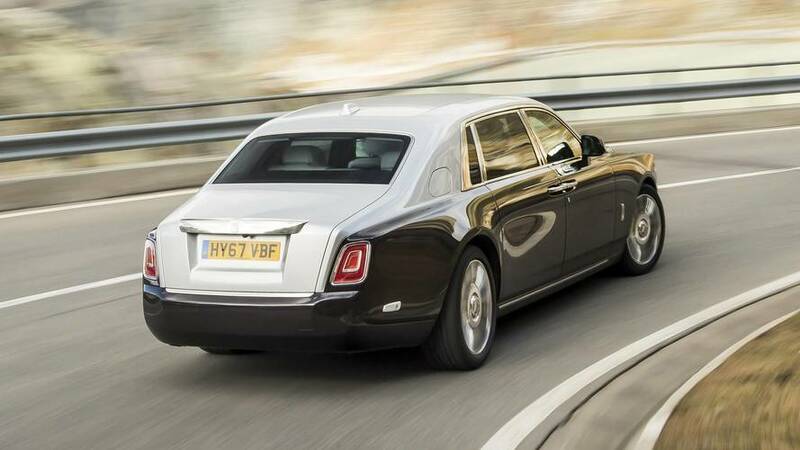 The chauffeur presses a flush-mounted button on the outside door handle, and the rear-hinged coach door closes electronically. Controls for the infotainment system are at your fingertips. The seats recline. They’re heated. They lightly massage. 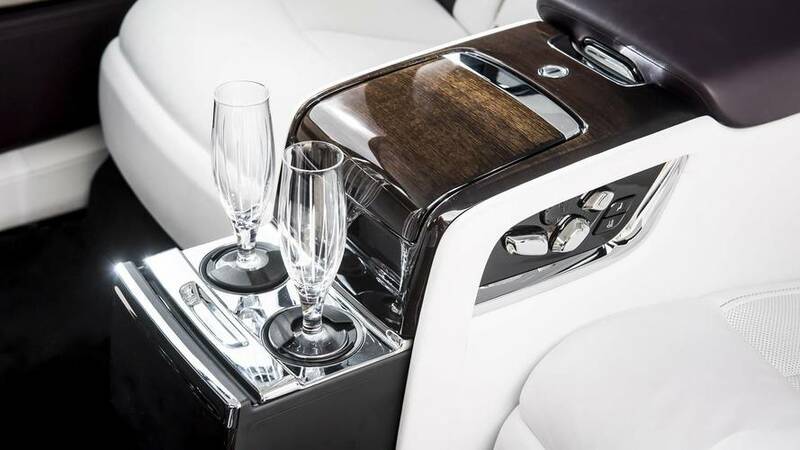 There are specific cup holders for normal beverages and separate ones for the hand-crafted champagne flutes that are chilling in the refrigerator behind you. The thick, leather headliner twinkles above with a starlight pattern. You take off your shoes and run your feet through the thick carpets. You are totally engulfed in the most luxurious experience available on the road today. 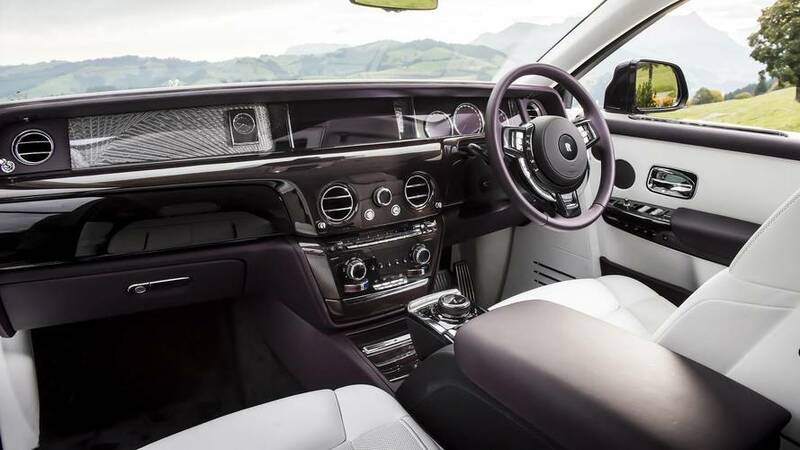 The idea with any Rolls-Royce is that you’re more relaxed when you get out than when you got in. And in the back of the new Phantom, I can feel my heart rate lowering by the second. This is hands down the most comfortable I’ve ever been while in motion. I have such a hard time falling asleep in cars, yet as the lush, mountainous scenery of Switzerland passes by outside the double-pane, six-layer-insulated, tinted glass, I’m finding it hard to keep my eyes open. That’s not the jet lag talking, either. But when I arrive at our coffee stop, my eyes grow wide at the sight of a dozen Phantoms – no two the same – gathered in the car park. This is a sedan with a real sense of occasion, a true presence on the road. A Phantom is a rare sight, no matter where you live, and this new one is appropriately styled with a grace and elegance that commands you to look at it, to pore over the details, to study the curves and the lines. Behold the majesty. Really, what could I possibly nitpick? I’m relaxed, removed from life’s annoyances. The Phantom has me wrapped in happy, peaceful silence. 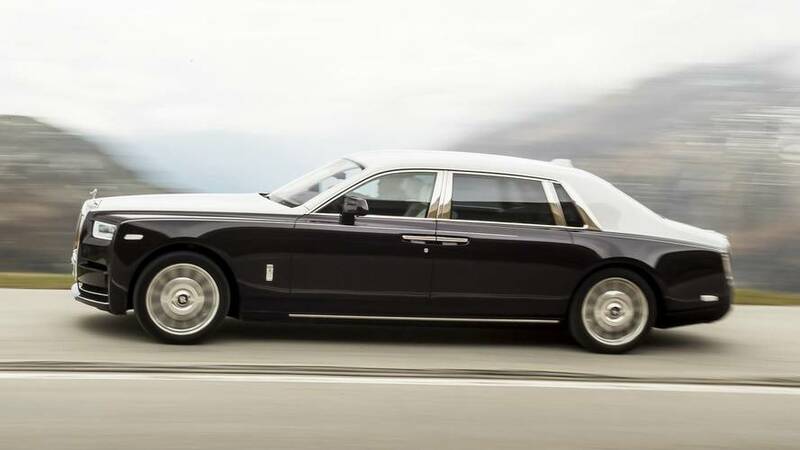 Rather than creating a shape that can be written off as “big Ghost,” the Phantom wears its own unique styling elements. It’s imposing and gentlemanly, with a long hood, upright front fascia, flowing body sides, and a rear end that tapers off toward the middle, a sort of elegant grace as the car leaves you in its dust. 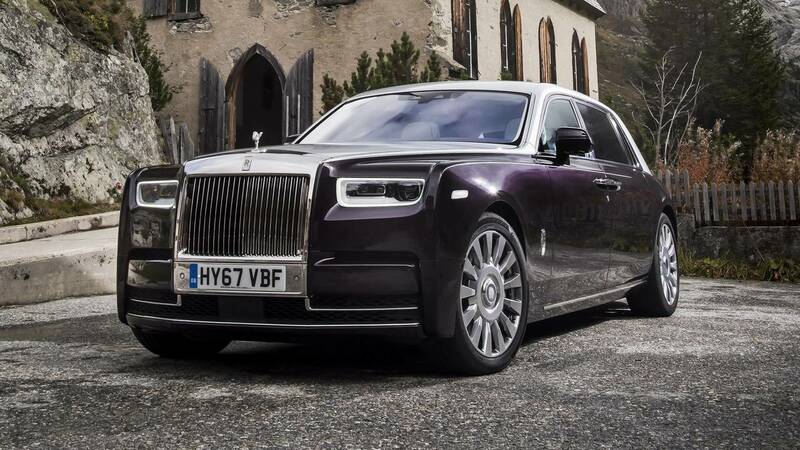 Both the 20- or optional 21-inch wheels look appropriate inside the Phantom’s huge openings, with the weighted Rolls-Royce center caps that always keep the logo upright while on the go. A single metal strip runs along the bonnet, connecting the grille to the windscreen, and this separation on the body almost encourages a two-tone color scheme, of which the paint combinations are endless. In fact, the Phantom’s entire realm of personalization is limited only by your checking account. Colors, materials, embroidery, veneers – they can all be tailored to your unique specification. And that’s before you get to the pièce de résistance known as the Gallery. A single sheet of glass spans the width of the dashboard, behind which you can feature, well, anything you can dream of. A digital gauge cluster is housed in front of the driver, a retractable infotainment screen (with a reskinned version of BMW’s iDrive) rises up from the middle. But the rest of the real estate is yours for the customizing. Might I suggest porcelain roses? Or perhaps an artist’s interpretation of your specific DNA? Do you want that gold plated? Or how about an individually commissioned oil painting? Or naturally sourced, five-year-aged French hen feathers? Or tufted rows of silk? Or hell, diamonds? And why not diamonds made from the carbon composites of your previously owned Rolls-Royce cars? All of these are possible. And that’s just the beginning. Yes, it all comes at a price: $450,000 for the standard car and $530,000 if you want the extended wheelbase. And don’t you dare scoff at that. For Phantom customers, price doesn’t matter. No one is cross-shopping a Phantom. No one is rethinking their budget for a year to see if they can put a Phantom in the garage. Deciding to buy the car is the no-brainer decision – how to truly make it yours, however, now that’s the hard part. As for complaints, well, I don’t have any. How can I find fault with a car this comfortable, this cosseting? Sure, maybe there’s the tiniest imperfection in the stitching on the pillow under my head, but that’s because every single thing in this car was put there by hand. Maybe the infotainment system reminds me a little too much of my stock broker’s 7 Series. Maybe the steering could be a little better, the brakes could have a bit more initial grab. But then again, those are my driver’s problems, not mine. Really, what could I possibly nitpick? I’m relaxed, removed from life’s annoyances. I am in happy, peaceful silence. I’m in the finest luxury car in the world.